Professor Bren's research interests lie in the fields of bioinorganic and biophysical chemistry. The Bren group has developed new methods for engineering and characterizing metalloproteins in the cytochrome c family, contributing to our understanding of how protein structure dictates protein dynamics and function. In ongoing work, we are employing a range of spectroscopic techniques to understand how the three-dimensional structure of metalloproteins influences their electronic structure and reactivity. In another major effort, the Bren group is developing metalloprotein- and metallopeptide-based catalysts with particular relevance to energy conversion. Metallobiomolecular catalysts offer a number of advantages including being water soluble and environmentally friendly. Furthermore, the use of protein engineering facilitates the preparation of multifunctional and modular structures and the manipulation of second-sphere interactions within the catalytic site. A current emphasis in the lab is the development of artificial hydrogenases, or enzymes that catalyze the reduction of protons derived from water to hydrogen (H2). Hydrogen produced from water is a green, carbon-free fuel, and hydrogen evolution driven by sunlight stores solar energy in the form of chemical bonds. The Bren group's artificial hydrogenases couple to synthetic, biomolecular, or nanotechnological photosensitizers to yield environmentally friendly assemblies to produce hydrogen as a solar fuel. The ultimate goal is to produce elegant and efficient systems that perform artificial photosynthesis. Kandemir, B., Chakraborty, S., Guo, Y., Bren, K. L., “Semisynthetic and Biomolecular Hydrogen Evolution Catalysts,” Inorg. Chem. 2016, 55, 467-477. DOI: 10.1021/acs.inorgchem.5b02054. Research Article in Forum on Small Molecule Activation: From Biological Principles to Energy Applications. 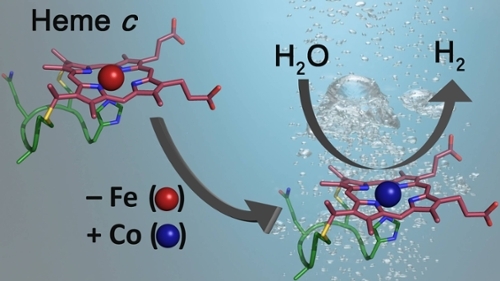 Kandemir, B., Kubie, L., Guo, Y., Sheldon, B., Bren, K. L. “Hydrogen Evolution from Water under Aerobic Conditions Catalyzed by a Cobalt-ATCUN Metallopeptide,” Inorg. Chem. 2016, 55, 1355-1357. DOI: 10.1021/acs.inorgchem.5b02157. Featured on journal cover and selected as ACS Editors' Choice.